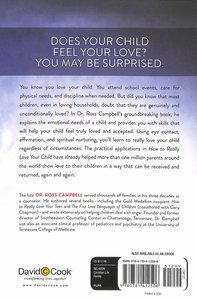 In Dr. Ross Campbell's groundbreaking book, he explains the emotional needs of a child and provides you with skills that will help your child feel truly loved and accepted. Using eye contact, affirmation, and spiritual nurturing, you'll learn to really love your child no matter what the circumstances. The practical applications in How to Really Love Your Child have already helped over 2 million parents around the world show love to their children in a way that can be received and returned, again and again. About "How to Really Love Your Child"
Customer Reviews For "How to Really Love Your Child"
A lot of this book is quite practical, and I like what he has to say about making sure your child experiences your love for them, not just that you feel that you love them. I was disappointed that there wasn't a particularly solid foundation set in scripture and the books aim seemed to be for you to raise a well adjusted, emotionally stable child (great!) but without much emphasis on leading and guiding them to come to faith in Christ. The last chapter is a good start for this but I found it came as a bit of an afterthought to the rest of the book. Still well worth a read though.